The monthly ArtSmart Roundtable brings together some of the best art-focused travel blogs to post on a common theme. This month we are discussing Color. Check out all the stories below! As the old saying goes – “Clothes make the man.” Nowhere is this more true than in Ancient Rome. They had a purple dye so rare and so valuable that wearing it was reserved for the elite. Eventually only the Emperor was allowed to wear full garments of this color, known as Tyrian purple. So where did this precious color come from? A sea snail native to Lebanon. Tyrian purple has with its own mythical origin story. Supposedly Hercules’ dog was feasting on sea snails and returned to his master with a purple stained mouth. This tale not only stressed the importance of the dye (by attributing its discovery more or less to the great Hercules) but has a grain of truth since it connects the color with the sea snail. The dye comes from the digestive gland of two shellfish native to Lebanon, hence why the color was named after the city of Tyre. Each Thais haemastroma or Murex brandaris creature contains just one drop of the precious liquid. It look approximately 250,000 shellfish to produce one fluid ounce of the dye . It’s easy to imagine just how valuable this color was in ancient Rome. In Republican Rome, wealthy men with more than 400,000 sesterces were inducted into a special class known as the equites. One of the perks of being an equite was permission to wear a narrow Tyrian purple stripe in your robes. Considering that the average Roman legionary was paid 900 sesterces per year, the equites could definitely afford this luxurious dye. By Imperial Rome, only the Emperor was allowed to wear purple. Even wearing imitation shades of purple made with cheaper materials resulted in punishment. By now purple was synonymous with power and so only the Emperor had access to any shade of it. 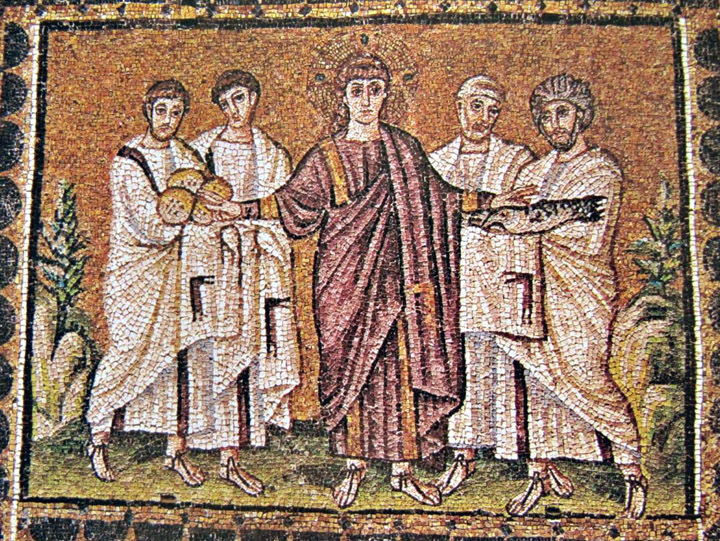 This association of royalty and purple continued well into the Byzantine Empire. Interestingly the fluid from the shellfish is initially clear but then oxidizes and reacts 2:1 with itself in the presence of air and sunlight. As the reaction progresses, the material passes through the chromatic scale becoming yellow, green, blue and then finally purple. The purple comes from the final compound, 6,6′-dibromoindigo, which has a long string of conjugated (i.e. alternating) double bonds. The color transition we observe as the compound reacts comes from these double bonds falling into line to make a longer and longer chain. The energy associated with this arrangement of bonds absorbs the wavelength of yellow light and reflects the complimentary purple wavelength of light which is what we observe. Of course chemists didn’t realize what was actually happening until the great synthetic dye boom of the 19th century – a full 3500 years after the Phoenicians observed this color and began dying cloth. Given the regal history of purple, you may want to add a little more of this color into your wardrobe. Philip Ball, Bright Earth: Art and the Invention of Color. Pliny, Natural History, 9: 36.